Jane Harper’s follow-up to her 2016 bestseller The Dry is another well-written, pacey crime thriller. 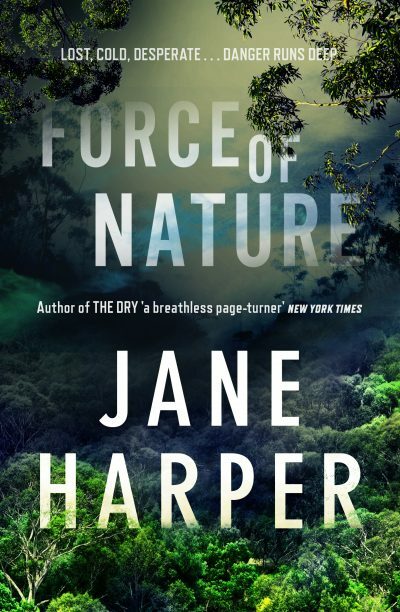 Force of Nature is set after the events of The Dry but can be read as a standalone novel. Federal police agent Aaron Falk is investigating the disappearance of Melbourne woman Alice Russell, who has gone missing during a corporate retreat in the Victorian bushlands. Alice is a whistleblower in Falk’s latest white-collar crime case, and Falk—along with his new police partner Carmen—is trying to figure out if the disappearance is connected. The chapters alternate between the search for Alice and the hiking trip leading up to her disappearance, where we meet Alice and four of her female colleagues, and discover their shifting loyalties. Fans of The Dry will enjoy this gripping page-turner, although it lacks some of the satisfying detective work of her debut. I would also have liked to see more development of Falk’s character and that of his partner, who remains lightly sketched; a scene between the two in Falk’s sparsely furnished apartment left me wanting more. However, the overall premise of the novel is intriguing and the bushland setting is well drawn (I imagined it taking place in Victoria’s Grampians, with a chilling Ivan Milat-style backstory). I look forward to more outings from Falk in the future.